It all started with a shawl. 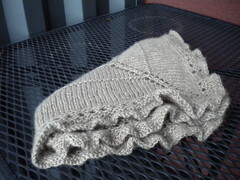 I knit it ages ago in a lovely laceweight cashmere yarn. 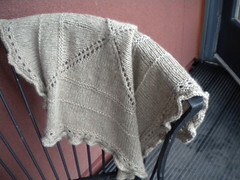 It was giant, warm, but light weight enough to wrap easily around the neck despite being longer than my arm span. 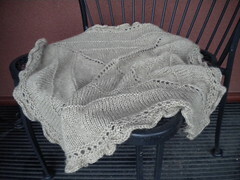 Pictures of the finished shawl escape me, but I have been wearing it for years. After years of heavy wear it was showing it's age from the hard wear- it got stuck on things, small rips, and other imperfections that made it harder and harder to fix. I already had wrist warmers in the same yarn, leftover from the end of the shawl. Rather than continuing to fix the many many mistakes I decided it would be better to turn it in to something else- I can always knit another shawl (right after I get more yarn! 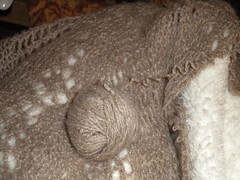 ), but the yarn really needed to be in something doubled, something I wouldn't have to repair. It took hours to unravel. 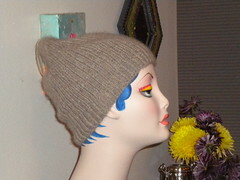 I made a top down hat in it with twisted rib at the base. 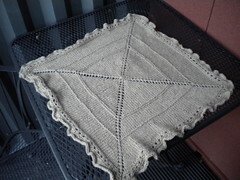 I still had tons of yarn left, but it needed to be something still pretty small, I wasn't sure I would have enough to a shrug or something similar since I had to double the yarn. I settled on a small blanket, worked from the inside out. 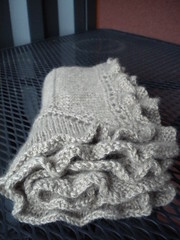 Invisible cast on, 8 stitches, yarn overs at each of 4 points (8 increases every other row). Easily bored and not wanting a totally plain blanket, I added a few rows of garter stitch in to break it up. The blanket it small, a stroller sized blanket (a bit over 2x2 feet). Tiny delicate ruffles at the edges add a nice finishing touch without taking away the gender neutrality. 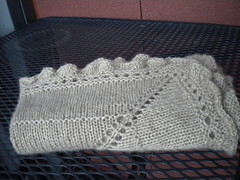 The increases started 2 rows after the yarn over decorative border, on the second garter ridge. The increases are pretty small- 2 rows of increases every 10 stitches, 1 row every 5th stitch, 2 more rows of every 10 stitches. It is super lightweight and warm, but will felt. I will have to save it for someone I know who is having a kid who will be able to handwash. Yep, I really love the ruffles. And the crisp look of the stitches, despite the halo. It's all about how to choose a correct companion who utilizes your funds in a right way - that is incorporate it in real deals, parts and divides the profit with me.